Bernie Sanders speaking in Traverse City, Michigan. Delegates in Michigan are split proportionally. With the win, Sanders picked up 65 delegates, and Clinton, picked up 58 delegates. The win adds new momentum to the Sanders campaign, which lags Clinton in the delegate count. Clinton still has a strong lead -- especially with her primary win in Mississippi tonight -- but tonight's win in Michigan sets up Sanders up for next Tuesday’s big primary voting in Illinois, Ohio, Missouri, North Carolina, and Florida. The eventual Democratic nominee needs 2,383 delegates to win the nomination. After the most recent primaries, Sanders has 546 delegates to Clinton’s 760. “This has been a fantastic night in Michigan,” Sanders said. He said he expects the campaign to do well in the primaries next week and in states in the West. 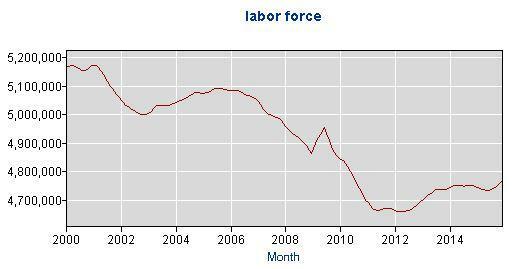 Graph showing the decline of Michigan's labor force since 2000. 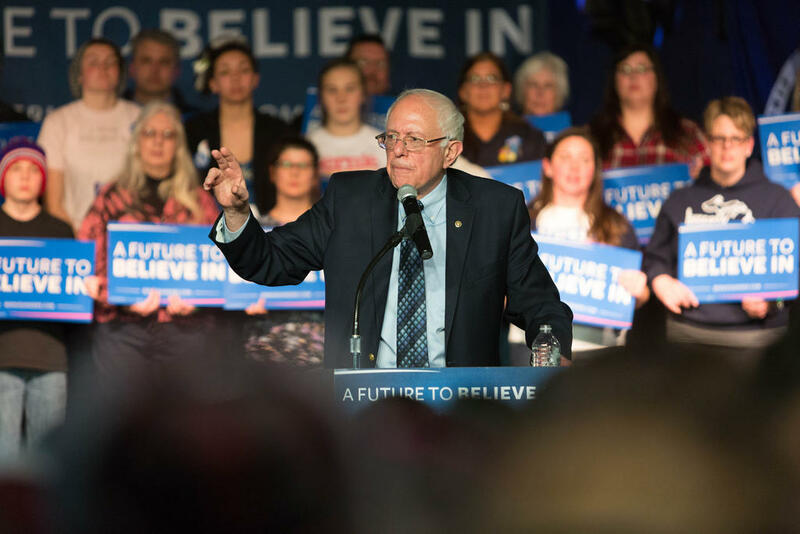 In a debate in Flint on Sunday, Sanders pressed hard on his message that unfair trade deals have left American workers without good-paying jobs – and that an economic recovery has benefited mostly wealthier Americans. His message likely resonated in a state that has seen some of the worst job losses over the last decade. Starting in 2000, the labor force in Michigan began to plummet – well ahead of the Great Recession in 2008. The state has seen modest gains in job growth in recent years. In exit polls, the majority of Michigan voters (58 percent) said they think trade takes away U.S. jobs, and Sanders was strong among those voters, with 56 percent of their vote. With another big-delegate Rust Belt state (Ohio) coming up next week, expect to see the Sanders camp amplify the trade message. If you count all the Democratic delegates available tonight, Clinton came out ahead because of her big win in Mississippi. She won that state with 83% of the vote. *This post was last updated on March 9 at 7:03 a.m. 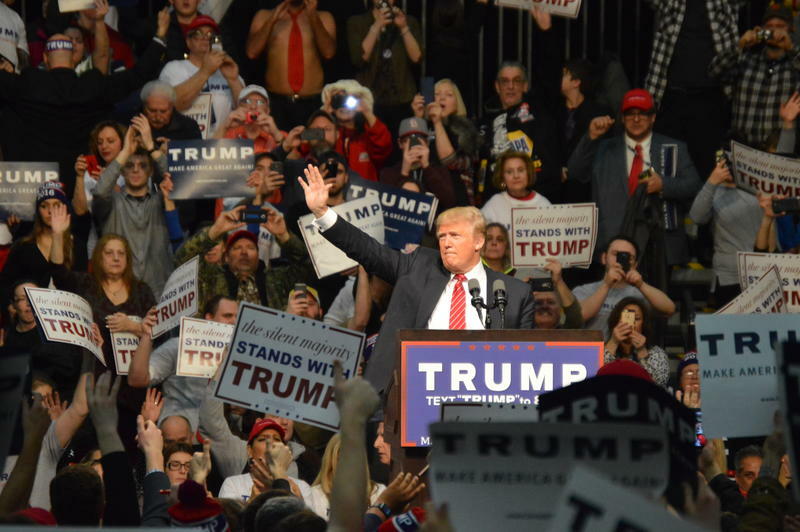 In a crowded field for the Republican nomination for president, Donald Trump continued to stay at the front of the pack. With the win in Michigan, Trump picked up more delegates toward his goal of winning the Republican nomination. If he secures the nomination, Trump will seek to become the first Republican to win Michigan in a presidential election since 1988, when George H.W. Bush was elected. 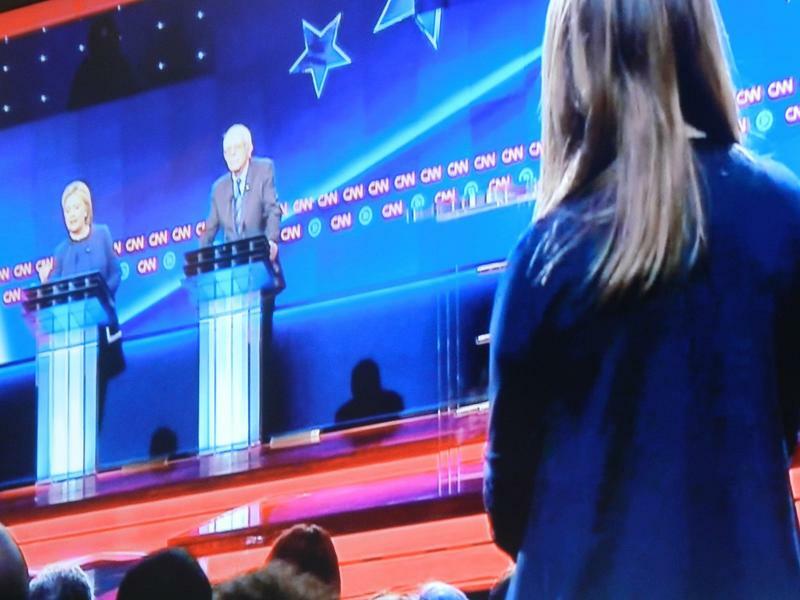 Democratic presidential candidates Hillary Clinton and Bernie Sanders didn’t agree on much during Sunday’s debate in Flint. But both want Republican Governor Rick Snyder to resign for his administration’s handling of the Flint water crisis. “His dereliction of duty was irresponsible. He should resign,” Sen. Sanders (D-VT) said from the stage at the Whiting auditorium. A statement which drew applause from the partisan audience. A few minutes later, Hillary Clinton echoed Sanders’s call. 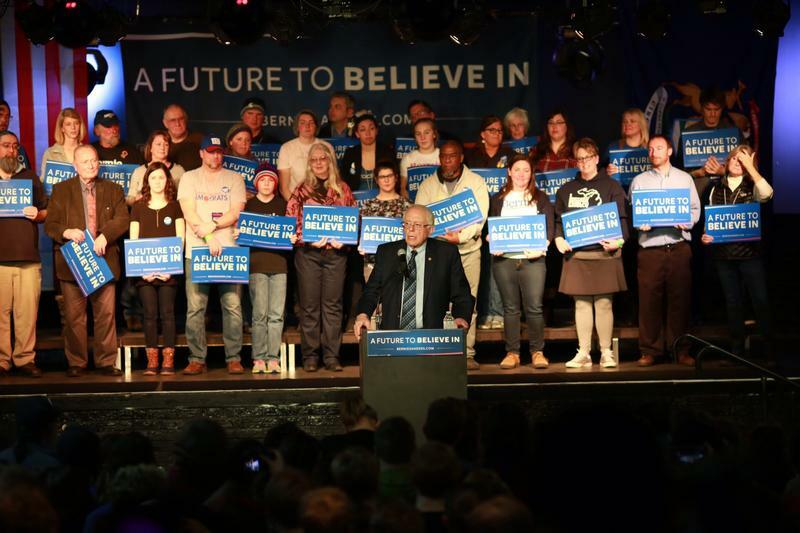 Bernie Sanders held a rally in Traverse City Friday. He told a packed crowd that the decline of Detroit, and the decline of the American middle class, is partly due to international trade policies. He says many trade policies cater to big money interests. With the Democratic Presidential Debate taking place Sunday in Flint, Michigan, the national spotlight is once again focusing on the city’s lead-tainted drinking water. 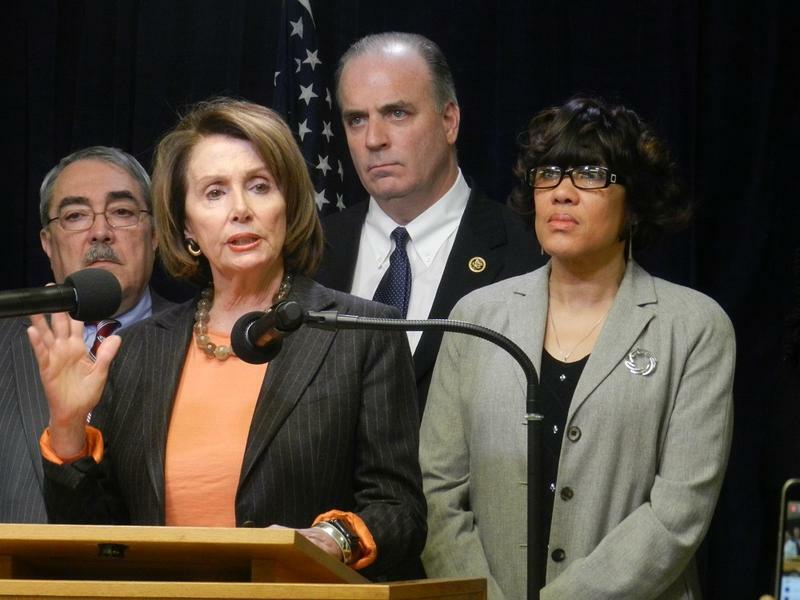 Some people in Flint are getting tired of being in the glare of the national spotlight. The whirl of electric clippers mixes with ESPN’s Sports Center on the TV and music from the radio as six men wait for one of two barber chairs to open up in the Consolidated Tattoo and Barbershop in downtown Flint.